Diego Luna's new directorial work for the big screen is a biography on civil rights activist and labor organizer, César Chávez. The film had a special screening at the White House, presented by the President of the United States, Barack Obama that is not only a fan of Luna's work, but claims Chávez is a personal hero. 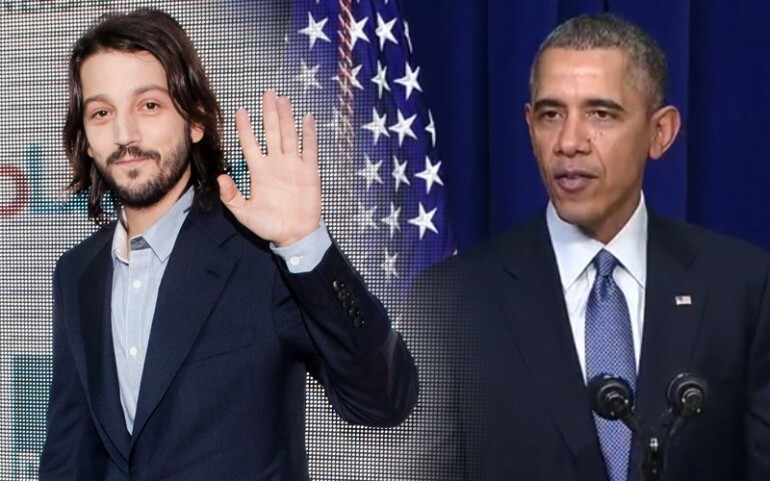 "I told [Diego Luna] I loved ‘Y Tu Mamá, También,’ but we can't screen that at the White House," Obama joked. "It's a great movie, but this is a little more family-friendly here." "César Chávez" stars Michael Peña in the titled role, America Ferrera, Rosario Dawson, Wes Bently, John Malkovich and a cameo from Gael García Bernal. The plot follows the efforts of the leader to organize a labor union for the farm workers in California. Chavez's fights opposition that turns violent and incites a revolution of human rights. "This movie, this film tells the story of a man guided by an enormous faith; faith in a righteous cause and a loving God, and the dignity of every human being," Obama said of the movie. "And it reminds us how throughout our history that faith has been tested, and that it falls to ordinary Americans, ordinary people, to fight and restore that faith." He also added, "Cesar himself said that he spent his first 20 years working as an organizer without a single major victory, but he never gave up. He kept on going, and the world is a better place because he did. And that's one of the great lessons of his life. You don't give up the fight no matter how long it takes. No matter how long the odds, you keep going, fueled by a simple creed -- sí, se puede." WATCH Obama's presentation of "César Chávez" down below!